The cells of our skeletal muscles have effective mechanisms for the repair of ruptures in their cell membranes. These ruptures are due to mechanical stress to which we expose our muscles even when doing healthy exercises. The cell membrane is an important barrier which is essential to the proper functioning and survival of cells. If this barrier collapses and cannot be repaired quickly, the muscle cell will die, resulting in a loss of muscle mass. People whose repair proteins, e.g. dysferlin, do not work properly develop atrophy of the muscles which leads to most severe disabilities and premature death. In an interdisciplinary cooperation project of the KIT research teams led by Uwe Strähle and Gerd Ulrich Nienhaus, the PhD students Volker Middel and Lu Zhuo developed new techniques to observe membrane repair processes with ultra-high resolution in real time in human cells and in muscle cells of zebrafish embryos. They proved that the repair patch assembling itself from repair proteins, such as dysferlin or annexines, also accumulated the phosphatidylserine lipid. Phosphatidylserine is a known appetizer for scavenger cells, the so-called macrophages. The KIT researchers presented a movie that shows how the macrophages indeed latch to the repair patch and eat it up. Only after the patch has been removed, the cell envelope is fully restored. 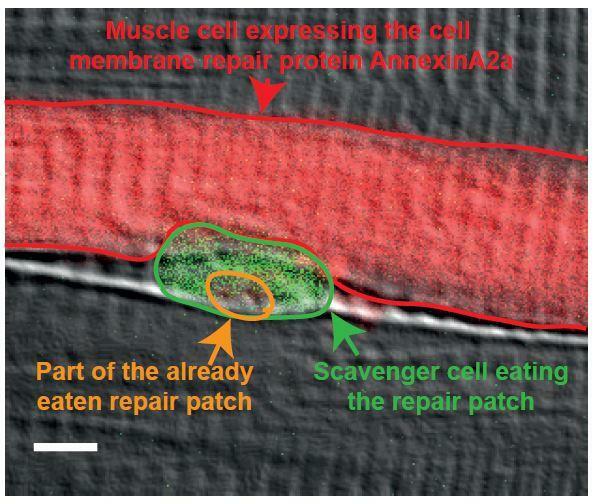 Thus, the repair of the membrane in muscle fibers requires, in addition to the formation of repair patches in the injured cell, the aid of macrophages roaming around within the muscle. The researchers further demonstrated that a short amino acid sequence in the dysferlin repair protein is responsible for the phosphatidylserine transport. It is remarkable that there are myopathy patients who have a defect precisely in this sequence of the dysferlin protein. The new findings may therefore contribute to the development of therapies against muscle atrophy.